Designed to offer a large cooking surface and an easy loading charcoal system. If you love to cook outdoors in the traditional way, then you’ll find nothing better than a high-quality charcoal grill. When you cook with charcoal you will enjoy the unique flavor that only charcoal can provide, and it’s a flavor that many enthusiasts insist on. Charcoal is more traditional, and it only requires a little more effort than cooking with gas. Of course, the quality of your grill makes a huge difference, and if you want to get the best results then you’ll need to choose something that can get the job done. 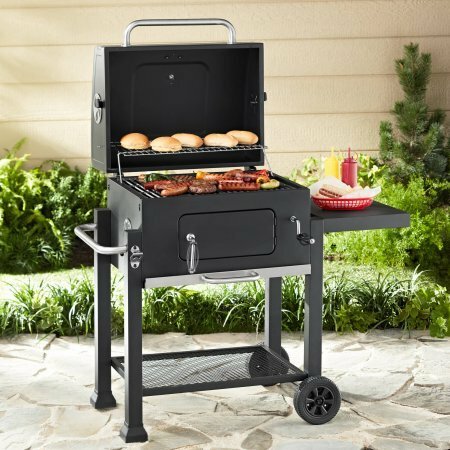 This doesn’t mean that you have to spend a fortune on a grill, which is evident with the Expert Grill Heavy Duty 24 Inch Charcoal Grill. Designed to offer a large cooking surface and an easy loading charcoal system, this grill could be the perfect addition to your deck, patio, or backyard. 372 square inch main cooking surface. 201 square inch secondary warming rack. Hooded design for top-down cooking. Charcoal collection pan for easy cleaning. If you are buying any grill online (aside from the smallest portable grills), you will have to accept that there will be some assembly required. This is not a problem as long as the manufacturer has taken the time to create clear and useful instructions. In the case of the Expert Grill, assembly is surprisingly simple. There are fewer parts than on a gas grill, which helps to cut down the time it takes to get fully set up. It could take anywhere from an hour to two hours, depending on how experienced you are with assembling large appliances. Once the grill is set up, it becomes apparent that quality materials and design have been used. Some grills can feel flimsy when completely assembled, but this is not a problem with the Expert Grill. The powder coated finish feels good, and the steel pieces have some heft that will give you confidence in the longevity of the grill. If you want an affordable charcoal grill but still need something that is of high quality, then this is a model that won’t disappoint. First impressions reveal a design that will appeal to first-time charcoal grillers as well as veterans. 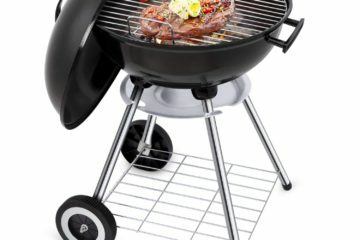 The grill is larger than it appears in product images. Total dimensions from the top down are 44.55 x 26.38, which results in a cooking area of 372 square inches. 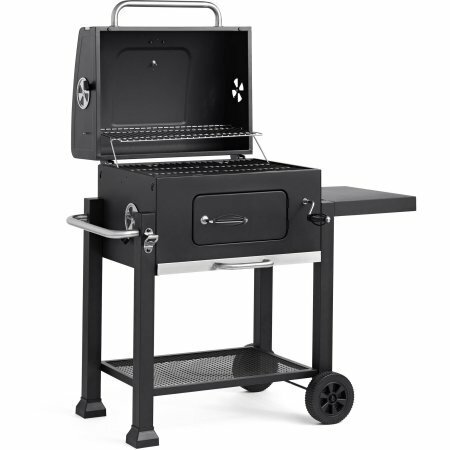 Looking at the grill, assembling it, and handling the individual parts leave no mistake that this is a high-quality unit. Most owners will be very surprised by the initial impression, especially considering that this grill is so affordable. Seasoning the Expert Grill is a simple task of loading it with charcoal and keeping the charcoal burning for at least an hour. Most grills with coating require seasoning before they can be used. Even pure stainless-steel grills should be seasoned to remove any residue that is leftover from the manufacturing process. Seasoning the Expert Grill is a simple task.Loading it with charcoal and keeping the charcoal burning for at least an hour. Alternate this method with the hood up and down, to ensure that every part of the interior is thoroughly heated. This will burn off residue and any chemicals that were used to treat the materials. You can follow this seasoning up with a quick clean of the cast iron cooking grids. Not every owner will season their grill, but it’s something that everybody should do. Without this step, your first meal from the grill could have a slightly altered flavor. It’s something quick and easy to do, and it will give you better results when it’s time to start cooking. This model uses cast iron cooking grids which should be seasoned before first use, and after cleaning for every subsequent cooking session. Olive oil is best for this process. You can simply apply a liberal amount of olive oil to every surface of the cast iron cooking grids and wipe off any excess with a paper towel. The olive oil will provide non-stick properties and seal the porous iron to prevent rust developing. Looks on a grill are important, and this model definitely looks impressive with its black powder coated finish. Even if a grill looks great it should also be able to cook well, and the Expert Grill Heavy Duty 24 Inch Charcoal Grill won’t leave you disappointed. The cooking surface is equal to what you would find on a mid-ranged gas or charcoal grill. It’s more than enough for family use and will even offer extra space if you need to use this grill for entertaining purposes. During holidays and larger gatherings of family and friends you will find that you can get all of your favorite food onto the main grilling surfaces. The size accommodates around 20 regular sized hamburgers, and you could fit a whole chicken, a medium pork loin, or similar cuts of meat. The charcoal fuel source is the main attraction of this grill, and it definitely allows you to impart a classic BBQ flavor on your food. The design of this grill even allows for some light smoking, so add your favorite wood chips or smoker pellets when you need some extra flavor. Unlike a gas grill, you won’t need to use a separate smoker box, because you can add the wood directly on top of the hot coals (you could still use a smoker chip box/tray for longer smoking sessions). Because this grill is intended for budget-minded buyers, there are some features that you won’t get. There’s no side burner, and there are no rotisserie mounting points. If rotisserie cooking is important to you, then you will need to look for an option around the $150 – $200 range. Overall, you won’t be disappointed by the cooking abilities. This grill does everything that it needs to at this price point, and the surface area is actually larger than what you would find on similarly priced grills. 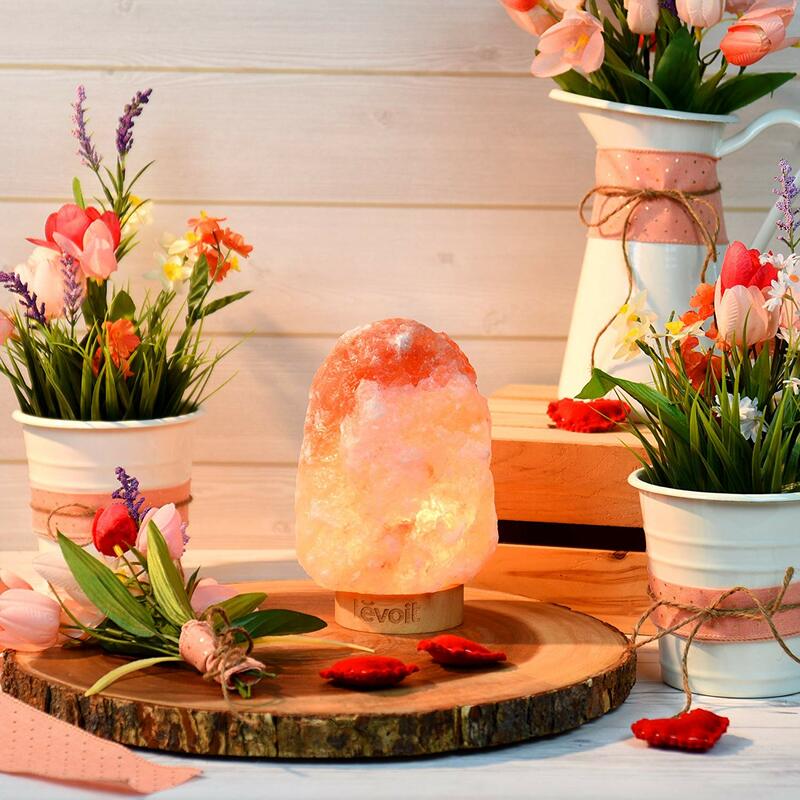 There are some nice additions like a built-in thermometer that will help you to closely control your temperatures when you are cooking with the top down. Cooking with a charcoal grill like the Expert Grill will be a little more involving than a similarly sized gas grill. You’ll need to manually control the cooking temperature by monitoring your coals and adding more as necessary. This is not a huge inconvenience, and anybody familiar with a charcoal grill will find that this particular model is easy to use. Even if this will be your first charcoal grill, it will only take a couple of cooking sessions before you get used to the charcoal fuel source. Things are made much easier with the front-loading charcoal door. 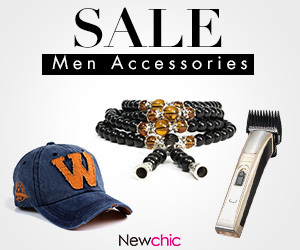 This allows you to replace coals without needing to go in from the top. If you are cooking with the hood down, then the loading door will help to keep the temperatures from fluctuating too much. The grill is also easy to clean, thanks to a large ash collection tray at the bottom. It can even be said that this is easier to clean than a gas grill, because you don’t need to worry about individual burners and heat shields. Simply remove the cast iron cooking grids for cleaning and you will have full access to the inside of the fire box. The folding side shelf on this grill makes things more convenient when you are prepping and cooking food, and it’s nice to see that it can fold down for easy storage. Airflow can be controlled by easy access vents on the sides of the hood. With most grills around this price point there are some compromises to be made. This is true for the Expert Grill, but none of them are so severe that they would detract from the cooking experience. Solid construction with a long-lasting powder coat finish. The cooking grids are made from high quality cast iron. The simple design allows for easy cleaning. Charcoal can be loaded without lifting the hood. Built in thermometer makes it easy to control cooking temperatures. Large size for an affordable grill. Good looking grill that would look great when displayed outdoors. Can be used for smoking. Only a single side shelf. Assembly can take a long time if you don’t have experience assembling large cooking appliances. If you are in the market for a budget charcoal grill, then this is one of the best options currently on the market. It is a good-looking grill with simple functionality, i.e., it simply gets the job done. Although you will miss out on some of the features that can be found on more expensive grills, they won’t detract from the overall cooking experience. 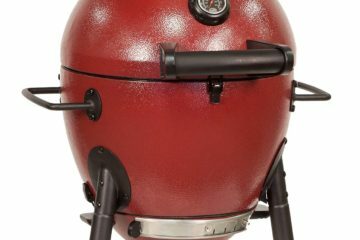 Being able to use this grill as a smoker is a huge bonus, and this could be the perfect option if you want to move away from gas and try your first charcoal grill. 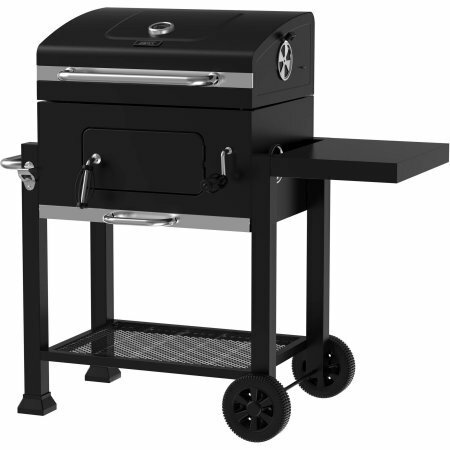 Overall the Expert Grill heavy Duty 24 Inch Charcoal Grill is worth a closer look, and if you want quality cooking on a tight budget then this would be a great choice.